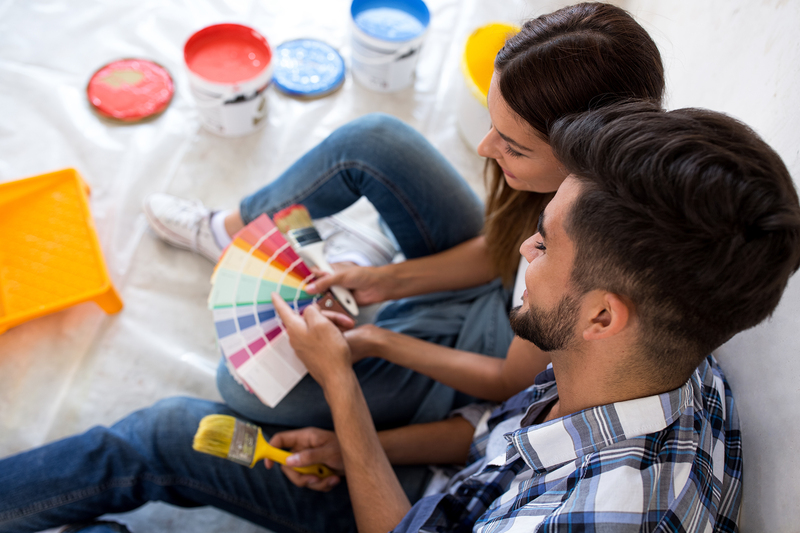 Whether you want to put your home on the market or it just needs to be updated for your comfort and enjoyment, you don’t have to spend a fortune. Figuring out how you can give your home an inexpensive facelift can be a fun challenge. When starting this rehab project, think of what you can refurbish rather than what you must buy new. Consider thrift stores and other second-hand venues to get great deals for less. A little elbow grease can save you a ton of money. Here are 6 easy ways to update your home without breaking the bank. When considering easy ways to update your home, you can bring your home into the 21st century by putting a bright hue on the front door. A bright color will make your door stand out from the other homes in the neighborhood. Variations of red, blue, and even orange seem to work well depending on your home’s color scheme. Update your curb appeal by giving a splash of color to the front of your abode. Some things that may make your space feel dated are old door knobs, light fixtures, and faucets. Now, you can choose expensive fixtures that will last a lifetime, but you can also get some nice ones that will be a fraction of the cost. When you are on a budget, you want to buy it for looks but not for life. A second-hand shop is also a great place to find all sorts of quality items that were pulled from older homes or remodel jobs. Simply replacing these items is one of many affordable and easy ways to update your home. Carpeting can be a problem in many homes. Not only does it harbor allergens, but it’s just hard to keep clean. Remember, it’s better to have a bare floor than to have stained and germ-infested carpet in your space. Low-cost laminate flooring is an excellent option for those who don’t want to pay for hardwood. Also, staining a concrete floor provides a unique look that is both affordable and easy to maintain. You will be surprised how updated your space will look when you add some fresh paint. If you are going to sell, then you may want to stick with neutral colors. However, if you are going to continue to live in the home, choose a bold hue that suits your personality. If you want to use a color that will pop, then you may just want to paint one accent wall to keep it from being overbearing. Considering the impact that a fresh paint job will have on your environment, the cost of the paint and supplies is minimal. You will probably have leftover paint from painting your front door, so why not paint one of your interior walls the same bright color? Part of maintenance is getting rid of the old things you don’t use so that your home appears more spacious. Did you know that clutter and unnecessary junk sitting around is a harbor for rodents and other unwanted pests? Never keep piles of newspaper or magazines around as they may be an open invitation to critters. Your space will feel light and fresh when you remove unused items. At least once per year, you should power wash the house and decks. You will be surprised at the amount of dirt and grime that settles on the exterior of your home. Siding that looked dingy and dirty will shine with a fresh, clean appearance. Renting a power washer once a year is an easy way to update your home at a minimal cost. At PRIME Home Inspections, we are here to help you get the most out of your home through inspections, whether you are buying, selling, or a homeowner maintaining your home. We offer inspection services to the Greater Olympia and Tacoma area of Western Washington. Click here to request our services.